ysabetwordsmith | Poem: "As the Creeper That Girdles the Treetrunk"
Poem: "As the Creeper That Girdles the Treetrunk"
This poem is spillover from the July 5, 2016 Poetry Fishbowl. It was inspired by a prompt from ari_the_dodecahedron. It also fills the "Identify a feeling you're having" square in my 5-1-16 card for the Solo Celebration Bingo fest. This poem has been sponsored by Anthony and Shirley Barrette. It belongs to The Moon Door series. "As the Creeper That Girdles the Tree Trunk"
the heart of the log garden. the area visible from the back door. a bird garden and a small pool. promises of a larger pond to come. for a den and especially pee on it. feel this sudden urge to claim it? to avoid romping around outside. "You seem upset," said Hilla. at the fair: everything went flying. in the chronic pain support group. other people around. It was maddening. "My wolf is driving me nuts,"
to dig holes and pee in the yard." Randie spun away from the sink. "That's not the point!" she said. "It's -- it's completely uncivilized. better than to act like this." "We're all animals," said Hilla. "Humans first, and now werewolves. The change affects how we feel." "I know," Randie said grimly. a gentle hand on her shoulder. clenching her hands in her hair. don't like to be alone, though." to do about this?" Randie said. strangled by a creeping vine! I can't live like this." stop gnawing at you so bad,"
said Hilla. "It works for mine." "I am NOT peeing in the yard!" "I meant digging," said Hilla. "Some of our new plants arrived. annuals so they'll grow fast." placing an order at the nursery. I'll put in the flowers," Hilla said. "It will be fun and productive." where the flats and the flowerpot waited. its pink tubular flowers hanging in clusters. the alyssum looked like a pile of cotton balls. I can't carry them all by myself." to point that out to Hilla. she could do a lot more than before. when everyone felt perfectly fine. so she didn't fuss about Hilla's habits. and picked up the fuchsia. and finally they started to work. and lay down to sleep. It was the first peace she'd had in ages. and moved on to the flat of alyssum. This poem's title comes from a line in "The Law for the Wolves" by Rudyard Kipling, out of The Jungle Book, which you can read online. Randie's house looks like this. The kitchen has a sunflower motif. The sun parlor has been converted to a home office. Here is the plan they're using to turn Randie's backyard into a wildlife habitat. At first, Randie's backyard was completely overgrown. 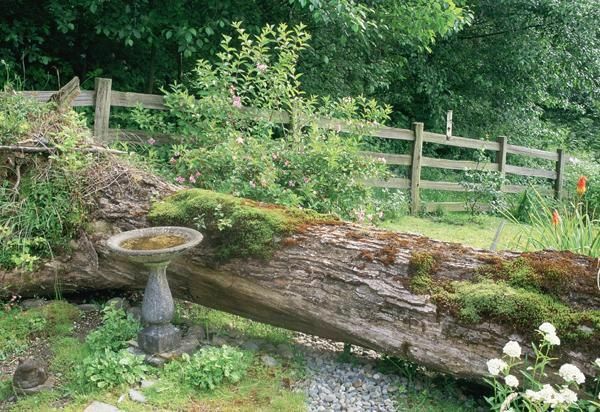 Digging into the backyard, they discovered an old birdbath beside a fallen tree, which became the log garden. The area immediately behind the house was cleaned up to create a bird garden, wildlife ponds, and a little bit of open lawn. An arbor was added with a bench seat, roof, and framework for climbing vines. Here is a closeup of the small pond at the lower right corner. When clearing space for a new garden, annuals make a quick splash of color, while perennials take longer to establish. Shade-tolerant annuals include fuchsia, lobelia, and alyssum. That's true of many issues. :D The wolves have their own needs. Getting them to settle often depends on finding needs that can be met without driving the human half up a wall. Read and liked. Too tired to comment more. Good poem. I'm glad Randie and wolf!Randie are communicating a little better, too. Hilla will likely get there, too - about doing things more. The more she's able to listen to her body the more she'll get to where... oh hey, I don't actually /have/ to sit down right now. >> That's a good compromise. >> Hilla will likely get there, too - about doing things more. The more she's able to listen to her body the more she'll get to where... oh hey, I don't actually /have/ to sit down right now. Best feeling ever. :D She'll get there. Do Hilla and Randie absolutely have to stay in their indoor den for the whole 3 days? In time, especially now that they're working on being in touch with their Inner Wolf, might they eventually gain enough control to be able to go for a romp in the yard and not want to range out further? I guess what I'm asking is, if the human can access the wolf, could the wolf be able to access the human? Not necessarily. And they don't have a den, they have a prison cell. It is much nicer than what Randie started with, but it's still a cell and the wolves don't like it. Alexandria's wolf is quite content with her awesome den in the basement, now that they've solved the baby problem. I'm sure she'd appreciate a chance to stretch outside, and she's probably calm enough to do it safely by now. So Alexandria is likely to be the first who goes outside successfully. Randie is too freaked by the idea, and will be for a while. Hilla lives with her so it rubs off somewhat. But they do have the advantage of being together; wolves like company, and that makes them calmer. Yes. It just takes practice and accommodation.